After years of hype and hope, LG’s 4K UHD OLED TVs arrived. Initially, though, the excitement of AV fans at the long-awaited arrival of these revolutionary OLED screens was slightly blunted by their apparent inability to play the new HDR picture format. Then, in a shock announcement that contradicted everything the company had said before, LG revealed that its current generation of 4K OLED TVs is able to play HDR after all. Eventually. OLED TV technology is perfectly suited to display HDR content based on its ability to deliver perfect black levels and infinite contrast. Once technical specifications for HDR are finalized, LG plans to provide a firmware upgrade for the LG EG9600 series, which will support HDR content. This network update will enable consumers to enjoy HDR content streamed through LG’s Smart TV partner apps or delivered via other devices through the TV’s IP interface. This unexpected development was great news for OLED fans. But if you read between the statement’s lines, it raises a few questions. First, it seems strange that the firmware upgrade only includes specifically the EG9600 TV series. LG has confirmed that owners of the EC9300 HD OLED TVs and, even more surprisingly, the LG EC9700 4K OLED TVs will not benefit from the HDR upgrade. Also, the specific language of the statement’s last line raises serious doubts over whether upgraded EG9600s will be able to play HDR from suitable UHD Blu-ray discs. The statement only talks about HDR compatibility via streaming apps built into the TV and external devices through an IP interface. It pointedly makes no mention of the TV’s HDMI inputs being able to handle HDR, which would exclude UHD Blu-ray from the EG9600’s HDR party. The oddest thing about this situation is that other manufacturers have stated that they believe it’s an easy job to upgrade current HDMI 2.0 sockets to the HDMI 2.0a standards likely to be needed for HDR UHD Blu-ray. With some HDR-supporting LCD TVs such as the Samsung UN65JS9500, it’s a bit odd that LG has declared that it’s going to wait until all HDR industry standards are fully completed before it rolls its EG9600 firmware update out. Maybe it is better to wait and be sure the firmware update when it emerges at least gets things spot-on. There is one other concern about the EG9600 HDR update, though—whether this generation of LG OLED TVs can deliver enough brightness to do the high dynamic range format justice. 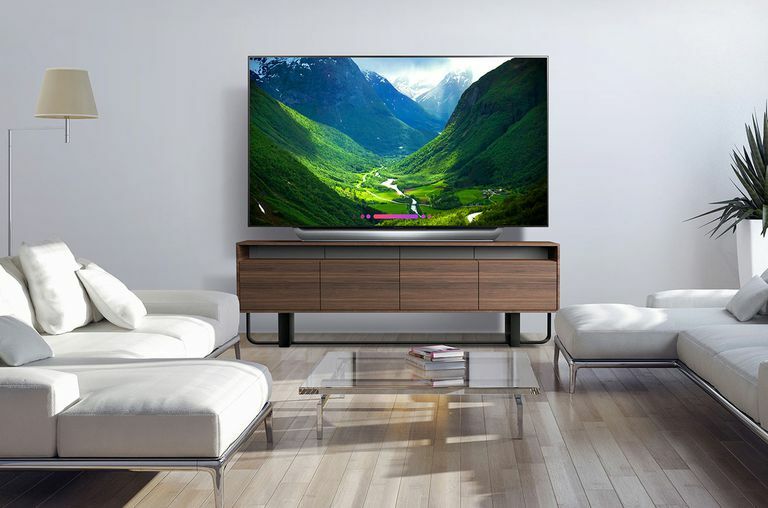 Dolby’s (admittedly unrealistic) take on HDR playback, for example, is built around a screen capable of pumping out a huge 4000 lumens of brightness, while Samsung has completely redesigned its LCD TVs for HDR to enable them to deliver a peak brightness of 1000 lumens. The EG9600s don’t hit even half the Samsung’s brightness levels. On the other hand, the EG9600 TVs’ OLED technology should help serve up a peerless contrast performance, so maybe this will provide enough HDR compensation for the lack of brightness.